Cybernet Worlds: Virtual universe based on ActiveWorlds software, but independent, that seems to reach a high quality, and a friendly community of users. VRWorkPlace: Virtual worlds for work. Work in 3D and have a virtual office. 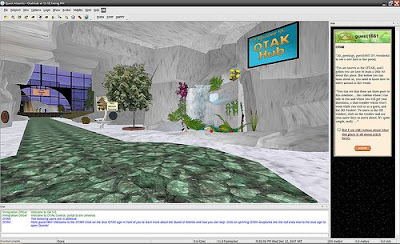 Quest Atlantis: Didactic virtual world for children between 9 and 15, to learn through virtual reality. Quest Atlantis. Photo by KJarret. AvatarReality's Blue Mars: Massive multiplayer virtual world that has stunning graphics and environmental effects. GeoSim Philly: The city of Philadelphia created in multiuser 3D. SmallWorlds: Cartoon style 3D chat worlds. Runs in your browser.